Hello and welcome to another edition of Graps and Naps this time taking in the first of PCW’s five shows of the weekend in Pryzm nightclub in Leeds. After picking @oggypart3 up from his and my former place of work Castle Greyskull, it was off to Rochdale for the train. I had a Shepherd Neame Ipa and I threw rkid a Carlsberg export to keep him quiet on the journey. 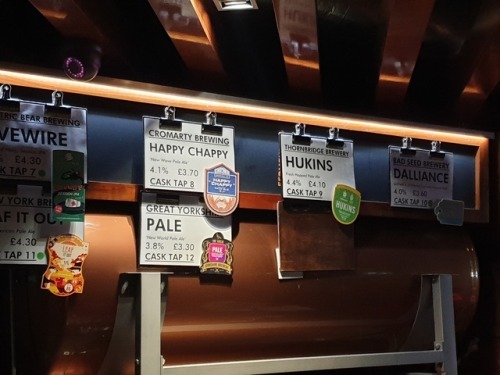 Once in Leeds it was off to Tapped in which I had a pint of Thornbridge Hukins pale ale at £4.10. Cue a ‘This is Hukins (Haskins)! chants and yes it did taste as bland as one of his many number one contenders matches in Progress. After picking up Andy Campbell we were off to the Assembly and it’s a tough choice with fifty 50 taps on show. I plumped for a Magic Rock dancing bier lager at £5.20 which was nothing special. Drinks done it was off to Pryzm where on arrival I had a bottle of Becks at a typical nightclub price of £4.50 – absolute dogshit so I kept to a total of 3 for the evening! The crowd of were greeted by the dulcet (and bloody loud) tones of ring announcer Connie Von D who introduced our first match between newcomer Jaxon Stone and Philip Michael (he’s got two first names etc). Phil starts the match by working over Jaxon’s arm until Stone took over with some brutal chops in the corner. Owww!!!. Jaxon continues with a double stomp and a jerseysault for a two. Phil makes a comeback with a dropkick until Stone turns the tide with a shoulderbreaker for a near fall. The end comes for Jaxon when Philip gets a jackknife pin for the three. Good overall match that got Jaxon over to a new audience – EVERYBODY!!! Plus a big win our Phil as he went into the Road to Glory tournament (see how he went on via Graps and Claps). Next is the PCW women’s championship, but the Buyout’s music hits as Sheikh el Sham, Tel Banham and Big T Justice come down to the ring. (Presumably Danny Hope was still in Tassletown undertaking sheriff duties?). Sheikh cuts a promo and gives it one fan by saying “I would insult you but nature beat me to it.”. Also another barb to our friend Andrew saying ‘I have more hair on my arse than on your head mate’! This brings out PCW matchmaker Greg Lambert who gets involved by saying all the championship belts that were taken off the Buyout at PCW’s last show in Blackpool will be given back if they are defended tonight. I did come out with a quick rhetorical quote as to the where the belts actually went, but I’d be a dead man if I said it on this blog. 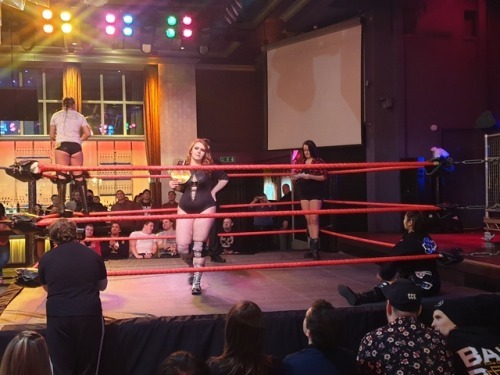 Anyway it’s on with the women’s three way with champion and Buyout member Nightshade, newcomer Desi Derato and queen of chantable names Yuu. Yuu and Derato start as Nightshade chickens it outside the ring. An even matchup until Yuu hits a spinning slam for a two. Derato comes back with a war dance culminating in a near fall on Yuu. Nightshade comes back into the ring and chucks Yuu out and then tackles Desi with two massive hip attacks and a cannonball in the corner. Yuu comes in to make the save and hits a JOHN YUUUUUUU!!! !, but to no avail as Nightshade hits a german suplex for the win to retain. Next is a two on one match between James Finn and partner Dave Birch vs current MLW champion and mma fighter “Filthy” Tom Lawlor. Finn and Lawlor start and finish in quick succession when James makes the mistake off grinding on Tom and gets choked out for his trouble. Birch enters next and is given an overhead throw for his trouble. The action goes to the outside were the chase is on around the ring until Birch decks Lawlor. Dave takes it back in the ring and hits a 619 and a springboard elbow for a two. The end comes for Birch when he also succumbs to a chokehold and taps. 1st half main event and it’s a bruising contest between Shigehiro Irie and ROH television champ Jeff Cobb. Both lads jockey for the upper hand by shoulderblocking each other which Irie wins. After another tussle Irie gets a suplex and then a bulldog. Cobb comes back with a gigantic dropkick, a splash and an almighty uppercut. Cobb eventually gets caught when Irie nuts him. Both men end up down with a double clothesline. Jeff comes back with a Roman Reigns esc punch and a moonsault. Irie fires back with a dvd and a rapid cannonball for a two. Cobb gets the duke with a back suplex and then a tour of the islands for a three. Absolutely amazing match and well worth seeking out when it appears. From the guys in the ring to the crowd popping like crazy near the end this was an early match of the year contender for me it was that good. Also to note as well the duelling chants of ‘Beast Mode’ and ‘Jeff Cobb’ that had PRYZM shaking – belting stuff! Half time drinks done our next match was Sheikh el Shambles and Big T Justice vs Magnificent Matthew Brooks and Sugar Dunkerton for the tag straps. Cue a cracking singing entrance from Brooks and of course more Sugar sugar chanting from the usual suspects. Brooks manages to get the early advantage by singing in the Sheikh’s ear. Big T gets a tag in and gives Brooks a mauling with a backbreaker and headbutt. El Sham comes back in and continues the beating until Brooks counters with a headscissors and a hot tag to Dunkerton. Both good guys team up and double clothesline Big T and then hit legdrops on the Sheikh, but T drags Brooks out of the ring. T gets back in and dominates Sugar and eventually gets the win for his team. Next up is another newcomer in Franco Varga versus PCW academy graduate BIG TIME Bruce Wheeler .A pretty comprehensive victory by Varga with a wicked F5/swinging neckbreaker combo for the victory to impress on his debut in the U.K.
Main event time and it’s T Bone vs the PCW double champ champ Tel Banham. Banham gets the upperhand by dropkicking Bone in the back when he wasn’t looking. T Bone comes back and brawls with Tel around the ring. Bone goes for a dive and misses, but comes back and slams Tel on the hardest part of the ring! Banham goes under the ring and jumps Bone from behind on the otherside. Tel trys chopping Bone on the chest, but seemingly just tickle him. T Bone then flings Banham with an overhead suplex. Banham kicks Bone in the gooly’s and pins him for a two. 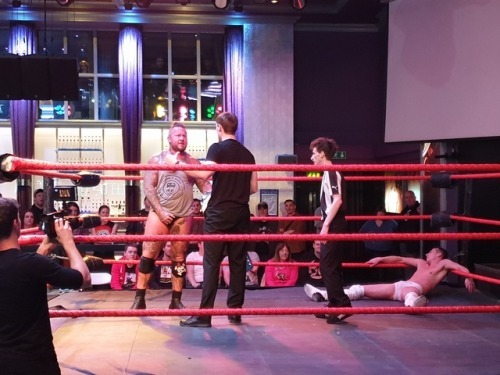 The finish to the match comes via dodgy ref shenanigans giving Tel Banham the win by dq and retaining his heavyweight strap. T Bone disputes this decision and drops the ref sending the fans home happy. 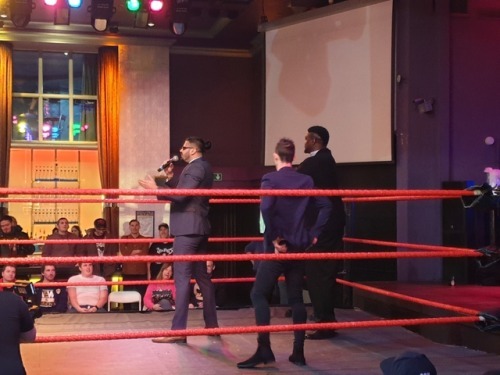 This ref continued to give decisions in favour of the Buyout over the road to glory weekend in Blackpool so check out @oggypart3’s review of that to find out what went down. Wrestling done it was off for a last drink in the friends of ham for a 12% coconut stout to finally see me off onto the train home. Thanks for reading and like retweet etc.